Why South Burgenland? Since I was a child, South Burgenland and the border area have been my number one holiday destination, which is why I’m all the more delighted about the wonderful cooperation with Urlaub am Bauernhof and the Sonnengartl. Far away from the hustle and bustle, here in the countryside you can really enjoy your holiday and indulge in the fantastic local cuisine. Finally, I was able take some time for myself and do the things I love, the ones I’m simply too busy to do at home. Of course, I’d like to report on this lovely break and my holiday in South Burgenland. During our trip, we stayed at the beautiful and idyllic Landhofmühle run by the Fartek family. Claudia, the lady of the house, is a wonderful hostess and absolutely lovely! Franz, our host, took a bike trip with us and enchanted us with his local Burgenland charm. You can read a bit more about that later. At the Landhofmühle, the Burgenland way of life is tangible. 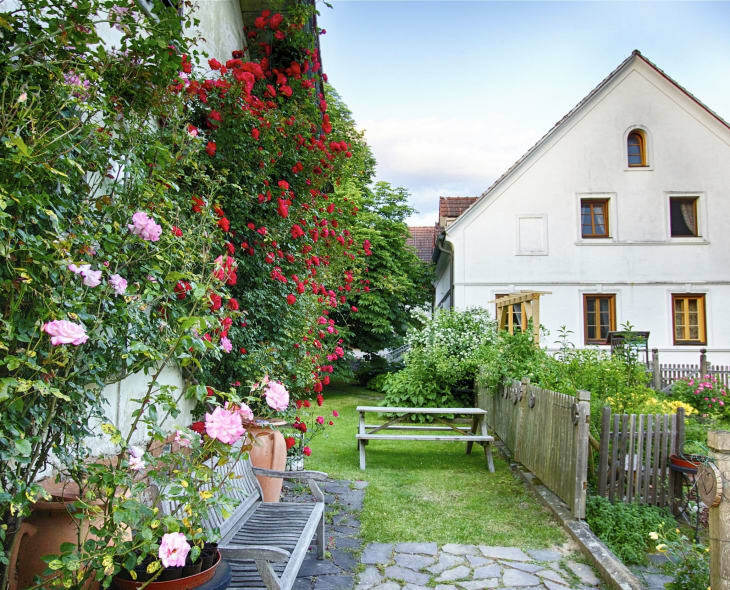 The old farmhouse was renovated with great care, and the garden invites you to while away the hours with a good book. All of the rooms have a rural interior design theme and exude a magnificent woody aroma thanks to the larch flooring. The breakfast conjured up by Claudia and Franz each morning was a delight! Countless delicious treats combined with locally-sourced produce. With every bite, you can really taste the freshness of the regional products. All of the delicacies are beautifully presented in little jars and on small plates and range from hot to cold, sweet to sour, and include vegetarian, vegan and gluten-free options, so there really is something for everyone. The atmosphere in the garden by the pond is hard to beat. Claudia and Franz always take care to ensure that all of their guests feel comfortable and that no wish goes unfulfilled. It goes without saying that I was blown away by the beautiful garden! Countless flowers, shrubs and herbs grow lavishly in the garden of the Landhofmühle and offer a habitat for numerous bees, butterflies and dragonflies. Enjoying the peace and quiet in a beautiful setting was simply heavenly. I could have spent hours in the garden, and I even took home some inspiration for our own future garden. And what can no farm be without? A cute housecat. The cat roamed around the farm all day long, enjoying the lovely weather, just as we were. Sonnengartl: What and who is that? The Sonnengartl association has been around for 14 years. It is an association of 10 wonderful, unique Urlaub am Bauernhof hosts and businesses, including a horse-riding company, a hotel and an oil mill, for special holiday moments. The businesses are all located around Minihof-Liebau, and are therefore very easy to reach by bike. During our trip, we decided to take some real time for ourselves and go on a great bike trip. Finally, a chance to enjoy nature again, and with an e-bike at that! Perfect! It was the first time for us. Neither of us had ever ridden an e-bike before, and what can I say, it was really practical! With this kind of bike, you can tackle the hilly area excellently, without even breaking a sweat. Beforehand, at the Landhofmühle, the lovely Claudia had marked all of the businesses and hosts that we should visit on a map and told us a little about them. Franz, the man of the house, accompanied us on the tour throughout the day and showed us everything. He’s not just a fantastic tour guide, he’s also an excellent photographer! The whole region is simply breath-taking and incredibly idyllic with all of the vines, forests and the hilly landscape. The bike tour is also excellently suited for families with children, as the farms cover different areas, which ensured deep insight into traditional family life in South Burgenland. In addition to home-made herb lemonades, grape juice and apple juice, there was also schnapps, regional wines, and a tasty snack including hearty specialty sausages, a variety of cheeses and rustic farmhouse bread. They were served with fresh vegetables and salad from the garden. It goes without saying that we were well fed by all of our hosts and took the opportunity to try everything! When so many wonderful, home-made products are placed in front of us, we simply have to sample each and every one! The trip also meant a lot to me personally, as I already knew the area a little and had spent so many lovely moments there with my family. Furthermore, I also think it’s important to visit and rate places other than the big, luxurious hotels. I find weekends like this one a wonderful break from my stressful day-to-day life that always bring me back down to earth. Proper quality time. To top it all off, we then baked and tasted delicious potato and apple strudel with Christine & Roland. After that, we sat together to see out the rest of the evening, enjoying long discussions and good wine and reminiscing about the lovely weekend. The holiday at the farm was also important as it allowed me to contribute to maintaining and supporting the rural economy, Austrian agriculture, its customs and traditions, and craftsmanship. Even as a child, I enjoyed the time I spent on the farm with my parents and grandparents, and as a result, came to develop a love for farm life.